When teaching with First Capture / Capture Game / Atari Go / whatever folks at your club call it, a few things make it smoother and more effective. Use the small board. I've read of teachers going as small as 3x3 for the first couple games, but I've never tried that. Use pre-placed stones to get the action going quicker. The point is to let the student rapidly get the experience to absorb the fundamentals of fighting. Starting with handicap stones on the 3-3 point is fine for real go, but too slow for the Capture Game. Please add your suggestions too. 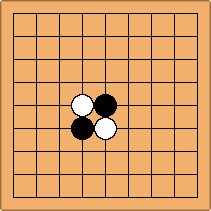 Basic starting position of Atari-go. These are the setup stones Bill Camp and Jon Boley showed me. It's Black's turn in all of these. This lets the student learn about ladders. Start closer to the edge. After Black captures White a few times, move a line or two away from the edge. 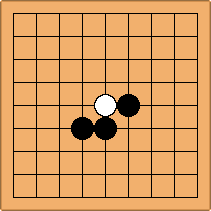 When Black is bored with this or always captures White, move to the stone setup in Dia.2. Playing with this setup teaches the student about nets. Once Black can recognize ladders and nets more often than not, start playing with the stones set up as in Dia.3 or Dia.4. A little more challenging for Black. 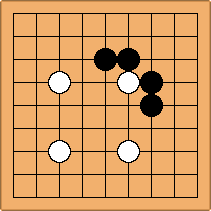 When Black beats the teacher in most of the games, start using the cross-cut setup in Dia.4. 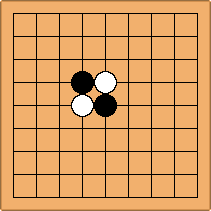 If beginners are playing against each other rather than against the teacher, then use the cross-cut setup in Dia.4. Here's the meat of the Capturing Game. It's best if beginners play each other. Pretty soon most games will end in a draw, with neither player able to capture any stones. Then introduce the idea of sacrifice / nakade, and have the winner be the first one to capture five or more stones, or the one who captures the most stones. 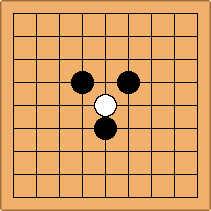 After several games, the players will start to make living groups on their own, without you trying to explain what an eye is or why groups need two of them. You may have to answer questions about seki and ko. When most games are again ending in a draw -- nobody captured anything -- you can switch to your favorite counting procedure to determine the winner. Presto change-o, your students are playing go (and with a firmer understanding of life, death, eyes, and false eyes than I had for the first 6 months I played). How long does all this take? In my experience, for most adults, a couple of hours to a couple of days. Some young children can happily play Capture One for weeks or months before moving on to Capture Five / Capture Most / Real Go. This leads to fears that inefficient habits, such as a preoccupation with capturing, will become ingrained (see also Atari Go Teaching Method). Jasonred : I suppose at some phase it'd be logical to throw in life and death exercises, involving snapback and such, then progress to the more complicated ones. I'd try to get life and death games in within the week. The ones which are really basic but look "cool". Probably, it'd be a good idea to have counting exercises after the first few days of starting capture game. To my mind, the trouble with capture go is not ingrained habits. The true problem is that ,with children even moreso, there is a certain element of learning when starting something new, even if it's just to have fun. Essentially, almost everything they "learn" about atari go, they will have to "unlearn" to play real go. Which can be frustrating. Especially if they were starting to get GOOD at atari go.